EESUN project - partner meeting - IMRO-DDKK Környezetvédelmi Nonprofit Kft. 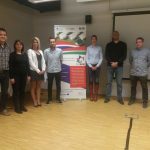 We hold the 4th (the last) projectmeeting in EESUN project on 3rd of October, 2018 in Pécs, in which participated the colleagues from Cakovec and Osijek. During the projectmeeting the partners disscussed about technical activities, the planning events int he last period. After the projectmeeting the participants wlaked around the Zsolnay Cultural Quarter, which funded by the Europen Union too. IMRO-DDKK Nonprofit Ltd. is the Lead Beneficiary int he EESUN project, which the implemantation period is 16 months.